Here in our ear plug department you will find what we believe is the largest selection of ear plugs available anywhere. Our commitment to ear plugs means you can be sure that we will continue to search for, and bring to our customers, the best hearing protection from around the world. We import ear plugs from France, Germany, The Netherlands, United Kingdom, Asia, Mexico, and the Middle East. Still, most of our ear plugs are made in the USA, where most of the ear plugs in the world are currently produced. For your convenience, our ear plugs are arranged in departments by product type. Here, you will find all our different types of ear plugs, from foam to reusables, to no-rolls to custom molded plugs to banded ear plugs - and even ear plugs for horses! We also include collections of products that we recommend for specific applications such as hunting and shooting, motorcycle riding, swimming, those suitable for children, and more. These collections can be accessed by choosing the relevant application from our menu bar above. Need help choosing? Try our handy assortment packs. Our ear plug assortment packs are an economical way to let you try out many ear plugs so you can find the ones you like best. If you have a favorite ear plug you cannot find, please let us know and we will do our best to help: . Moldable earplugs offer a great solution when you cannot stand to have an ear plug stuck in your ear canal, or when you just cannot get a good, comfortable fit in a reusable earplug. 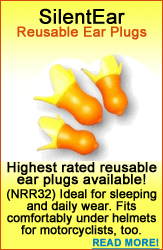 For swimming and sleeping, especially, moldable earplugs offer an excellent alternative to other kinds of ear plugs and we offer a wide selection from which to choose. Custom molded ear plugs are the best ear plugs for everyone because each pair is uniquely crafted to fit your unique ears. Two types of custom molded plugs are available: professional lab custom molded ear plugs, which are the finest quality ear plugs you can get, and do-it-yourself custom molded plugs, which provide some of the same great benefits of professional custom plugs at a fraction of the cost. Electronic ear plugs are a superior choice for any situation in which you need hearing protection and situational awareness. Excellent for hunters and shooters, for music educators and musicians, and for industrial workers. Situational awareness and smart hearing protection make electronic ear plugs some of the very best hearing all-around safety equipment available today. Earplug accessories? You bet! We offer carry cases, neck cords, banded ear plug replacement tips, custom molded ear plug accessories, and much more to help you get the full benefit from your investment in hearing protection products.